By Andrew Gavin Marshall in Culture & Society, Economy, History, Latin America, Media/Propaganda, Politics, Poverty & Inequality, Social Engineering on September 7, 2012 . We have enjoyed so many of your articles; when we found that you are so young, we were amazed , because not many your age have been able to get the big picture, especially with your well researched background. 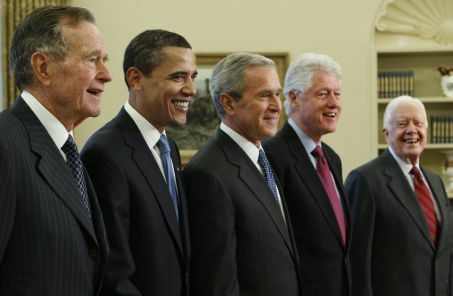 I have a suggestion for you to read in order to ascertain what Gary North was referring to in his latest article, which defines what all the presidents you pictured have in common. It has again happened again, ever since FDR, at least. It is also the reason the whole world is going to go bankrupt, for the sake of the greed and control behind the “world financial system and the U.N.” It’s called corruption for control ! The US has not had a presidential candidate that has NOT been handpicked by the real controllers behind the scenes in my memory, and I am 77. Here is Gary North’s article, please note the terms “CFR A” & “CFR B”. The only candidate I voted FOR, as opposed to against, was Barry Goldwater , but the Rockefeller paid press made up lies which were believed by the uninformed public, same as the Republicans’ preplanned dirty treatment of Dr. Ron Paul this year. ( He was the only one that had told the truth about what was happening to our country for 30 years, and he was right, so again the CFR worked their evil ways on the presstitutes, from whom most people get their “News” on TV. Thanks again for all your research and efforts: I would like to make what will necessarily be a small contribution toward your book, and wish you all the success possible in that endeavor. I am still trying to get some money to you; the last time I used Pay Pal, I had my identity stolen, and it took a long time to get my money back, so I no longer use Pay Pal. I have a Mac computer, and sometimes it fails to talk to Windows , except in gibberish, so maybe I can find a way to use my Master card, but your page only refers to Canadian addresses when I am trying trying to use the Master Card. Oh, and sometimes the reply on trying to enter my card number, it says my number is invalid, when it is not ! And sometimes it even says I have a non valid email address ; it is kind of odd, but it’s real, which is what happened when I tried my Discover card. Anyway, do you have a way to get around this ?